Overnight at a camp ground in upstate New York, keeping it light at around 55 miles of biking. 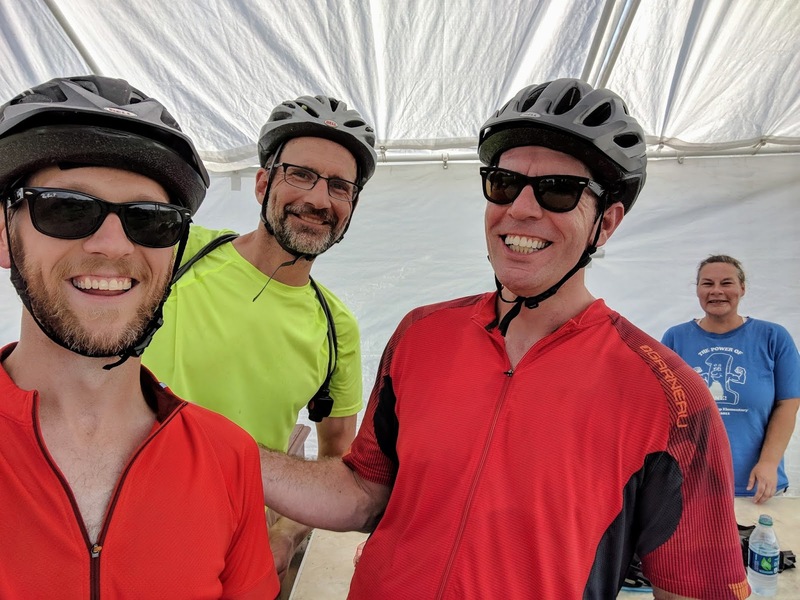 Jim, John, and Adam. Adam and I have done an overnight or two before, but this was John's first time doing anything like this. 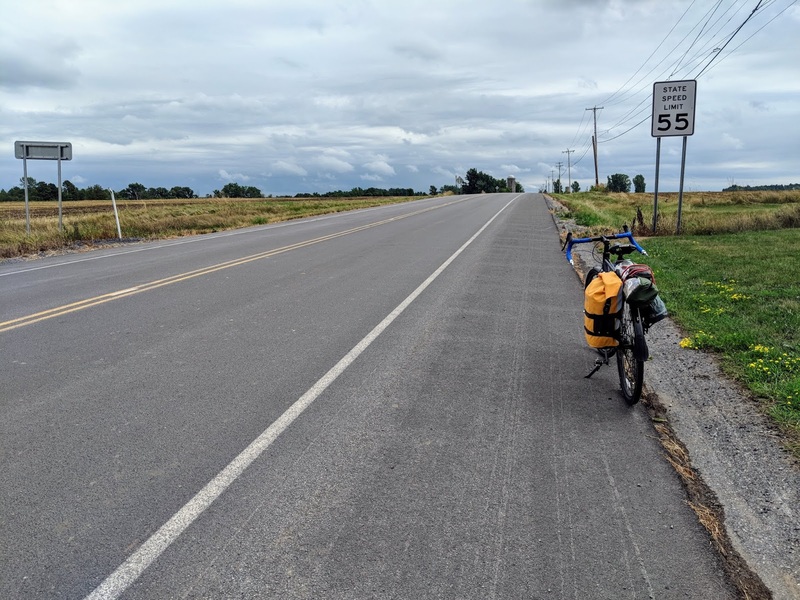 Route 3 is a moderately bike-friendly highway that's just inland from the eastern edge of Lake Ontario. It had the attractive feature of presenting a straight line between our starting point and destination. 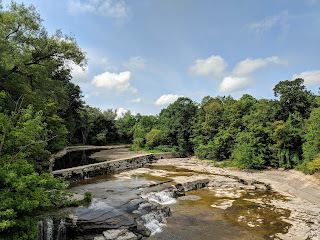 To dodge traffic, add some miles, hit a few stops, and vary the scenery, Adam plotted an alternative route that focused on back roads, passed through a few small towns, and gave us a chance to check out Monitor Mills Falls. This was a surprising gem with very little indication of its existence, and we blew right past it initially. It was worth the backtrack, though. It's a short way (less that a quarter mile) down Monitor Mill Road off of 289, but there are no signs. You'll see it when you cross a small bridge. 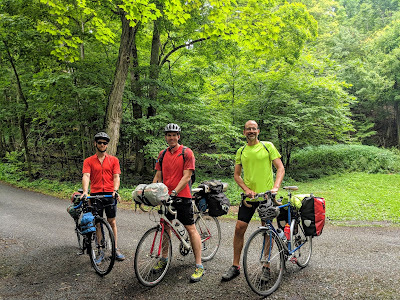 There's a parking lot (a grassy field) on the south side of the road, from which you can find steep trails running down into the creek valley. One of these even has a rope aid the descent. Alternatively, you can walk across the street to the entrance of a field, and follow a gently sloping grass path down to the upper part of the falls themselves. When we visited, the water was low. A later trip back featured water gushing across the entirety of the stone wall. The low water allowed us to splash around safely, and fully explode the lower part of the falls. It was a great stop, and very refreshing. There were a few more hills that we originally expected. At the crest of one of the bigger ones, we couldn't resist taking a quick break and picking some blueberries at Farnham Farm. 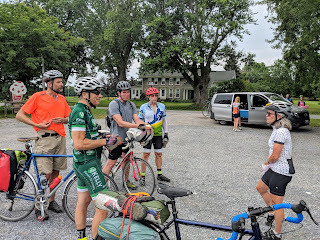 Some friendly conversation with the woman at the stand, a local of near-by Pulaski, a potassium rich snack, and some rest for our middle aged legs, and we were off again. We went in to Selkirk Shores through a back way, that would have only been accessible via bike, as the gravel road was gated. This was accessible via Pine Grove Road. The park itself was very nice, with a different feel to it than the rest of the area... Cooler, older, mossier. It felt like we were in a state park. We didn't have time to explore it, as it was late when we arrived, but there trails looked well groomed and maintained. We camped in Loop B. The sites felt a bit cramped and close together; there was no natural separation between each spot. However, this was fine for the evening, as it wasn't crowded and quite. The area for tents was level, and there was a fire pit. The outer sites on Loop A looked slightly more secluded (though not much) with a small about or natural separation between the sites. 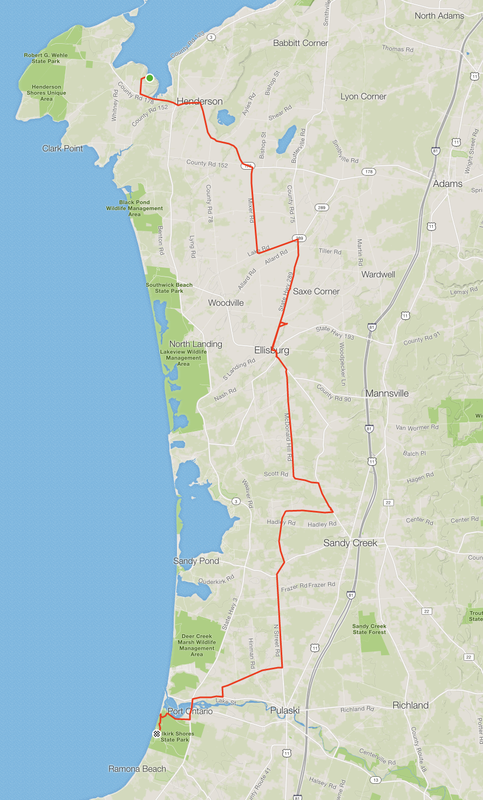 Our initial concerns about Route 3 were that it was too busy and would feel risky. That concern was reinforced for the first two miles, where pavement grooming was occurring, the lanes were tight, and it seemed like all commuters upgraded to semi trucks. Fortunately, once the construction ended, the wide shoulder revealed itself and it was pretty easy going for the rest of the way home. We were passed by several other bikers during a breaks, and we didn't have any close calls. 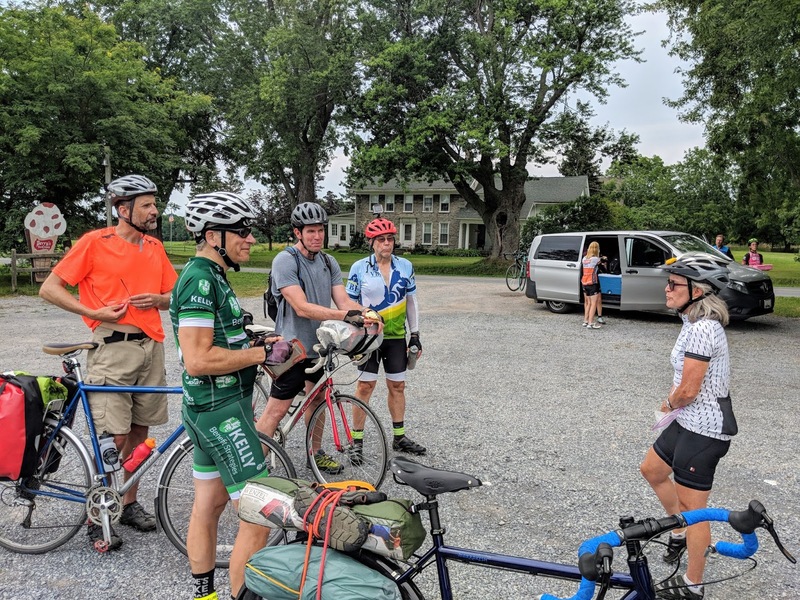 At the Trolley Ice Cream shop, we were flagged down by a large group of riders touring from DC to Canada. 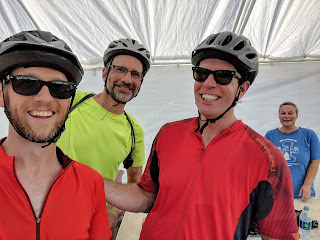 They offered us some giant cinnamon rolls that we couldn't refuse, despite the stop happening between our recent snack break and an imminent lunch. I wish I had captured the name of the group! Here's the full photo album, if you're interested. Copyright © James B Podroskey. Simple theme. Powered by Blogger.